What is inspiring, different, and refreshing about the Schwinn’s work is that they’ve put people at the center of their journey. We meet many inspiring and exemplary leaders, but after reading their stories, what I remember most about them is who they are, not what they did. For far too long, we’ve ignored the fact that the most powerful leadership skill is “Know Thyself”–the truth expressed in ancient Greece at the Temple of Delphi. Carole and David skillfully guide us into the perspectives and practices that create true self-awareness; from such awareness, transformation at all levels naturally occurs. 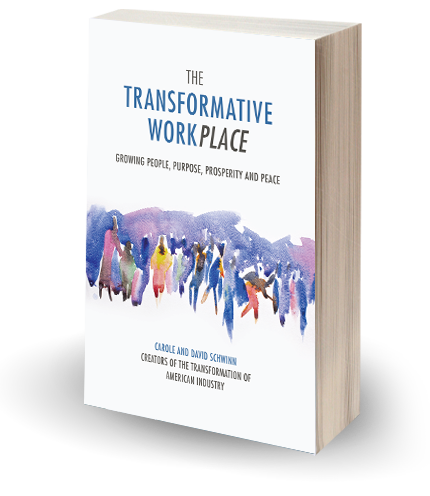 Given the state of our world, it seems that we are in an unstoppable cycle of disintegration, yearning hopelessly for leaders who believe that the workplace can be an incubator of the soul. Thanks to Carole and David Schwinn, our passionate guides, we learn that these leaders already exist on every continent. Their stories and the Schwinn’s research are a map for creating a compelling, alternative future.